Essendon Football Club is delighted to announce Olympic Gold Medallist Kim Brennan AM has been appointed Number One Ticket Holder. The daughter of Essendon champion Max Crow, Kim Brennan is an Australian World Champion and Rio Olympic Gold Medallist in Rowing. A lifelong Essendon supporter, Kim Brennan has a law degree, is Deputy Chairwoman of the Australian Olympic Committee’s Athletes’ Commission and is working full time at Ernst and Young in their Technology Advisory Business. 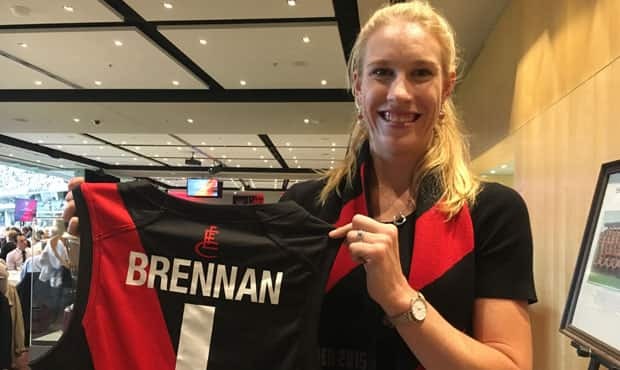 Brennan, who was awarded the 2016 Female Athlete of the Year, becomes the Club’s first female number one ticket holder and said she was honoured to be appointed to the role. “I was always a huge Bombers fan growing up and regular footy games were something I really missed when I moved up to Canberra for rowing,” she said. “Essendon is a big part of my family. I love how well the Club looks after its past players. My Dad still has a great network of mates from his playing days. Essendon Chairman Lindsay Tanner said the Club was extremely pleased Kim had accepted the invitation of the Board. “Kim is universally admired and respected. She is an elite athlete, wonderful role model in the community and a person of the highest integrity. “Kim will be involved in a number of important and meaningful initiatives with the Club across gender diversity, player leadership and career transition, and women’s football development. Brennan was formally announced Number One Ticket Holder at Essendon Chairman’s Function this evening and had the honour of tossing the coin prior to the Essendon and Hawthorn blockbuster at the MCG.